I have been super busy, but I have to slip in a post. Here are a few pictures from Easter, we had great fun, we love Easter, not just the hunting and the treats but the great meaning behind it all. Thanks you Jesus for your great sacrifice. My son is reallllly into dinosaurs and has been more almost a year now. 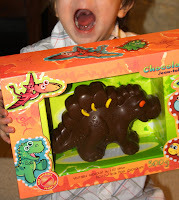 He was so happy to get his big chocodino. My nice is just about the cutest bunny I ever laid eyes on. We enjoyed some cupcakes from Cococake. My sister in law has been sewing and sewing, she made her daughters Easter dresses and their dolls dresses to match. Keep a watch out, she has a new store opening soon. I will post the grand opening when it arrives. Lastly these are my bunnies, made for the loveliest little girls I know .